The goal of this semester project was to propose a product that converts a high dynamic range (HDR) image into a low dynamic version suited for display, while conserving a high level of detail and contrast. The HDR image is build from several images of the same scene with different exposure times. The work is divided in two separate tasks: fusion and dynamic range compression. First the input images are fused to result in the so-called HDR image. Then the dynamic range is reduced thanks to tone-mapping. The intent was not to obtain colorimetric accuracy but a nice-looking reproduction, where the images are visually pleasing to the observer. 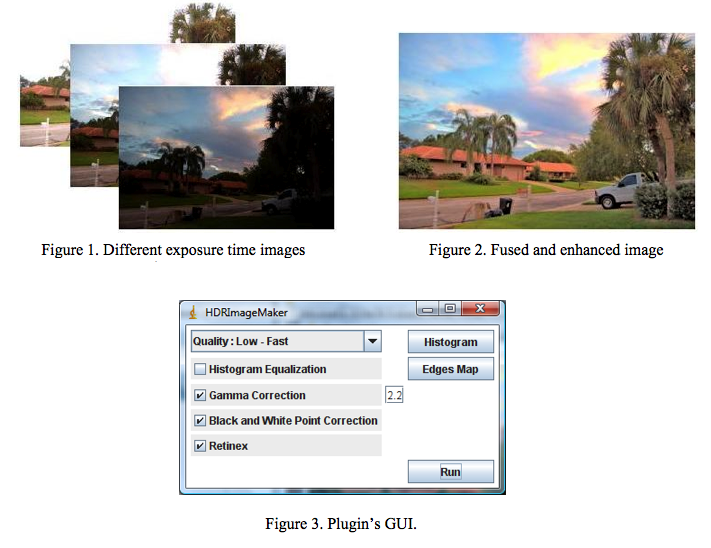 Several enhancement operations are applied to improve the visual quality of the image. This algorithm has been implemented as an ImageJ plugin. In addition, a graphic user-friendly interface has been created that simplifies the selection of the different steps to be performed.